In an EIS, SEPA requires analysis of the “No Action Alternative,” against which the effects of the action alternatives can be evaluated and compared. Under the No Action Alternative, the District would maintain the current level of protection for the existing PL 84-99 Program levees and other levees and revetments. The No Action Alternative assumes that the District will complete the projects in the adopted 2018–2023 Capital Improvement Program (CIP) (Resolution FCD2018-06.2), including those Interim SWIF Capital Projects listed in the CIP. The No Action Alternative also assumes that the District will continue to make repairs to facilities, including to the PL 84-99 Program levees as needed, in accordance with the Interim SWIF Vegetation Management Plan. Under the No Action Alternative, there would be no system-wide increase in the level of protection. 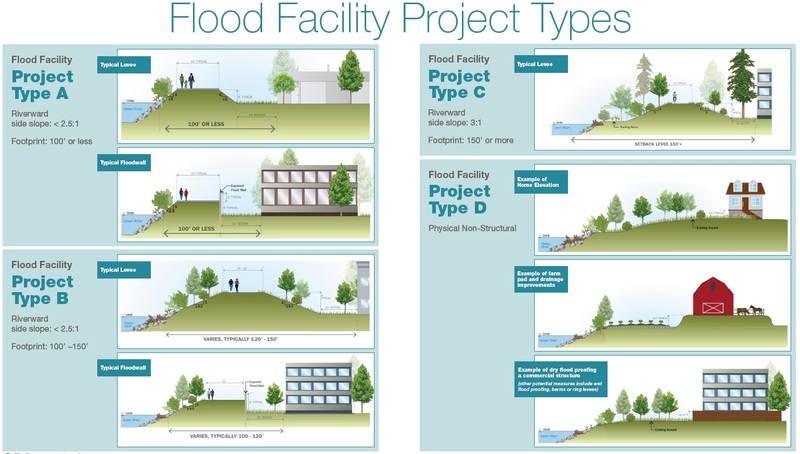 However, approximately 2 miles of new facilities included in the CIP would be designed at the higher level of protection to contain a flow of 18,800 cfs plus 3 feet of freeboard. 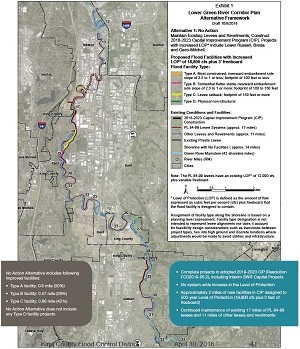 The No Action Alternative would also include maintenance of the existing 17 miles of PL 84-99 levees and 11 miles of other levees and revetments. Type A facility: approximately 0.6 mile (30 percent of the new facilities). Type B facility: approximately 0.57 mile (28 percent of the new facilities). Type C facility: approximately 0.86 mile (42 percent of the new facilities). The No Action Alternative would not include any Type D facility projects.